ZUCA Hello Kitty, Good as Gold SE w/ Pink Frame. 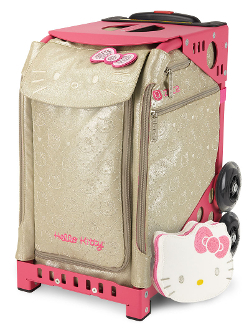 Go glam with Hello Kitty in whimsical, glimmering gold and shiny crystals! This super-sparkly, winning bag ranks high in fashion … and function. Includes Pink Frame and mini pouch, while supplies last. Turn your Zuca bag into a weekender bag. The optional Pro Packing Pouch Set includes five packing pouches of various sizes and a one quart TSA compliant toiletry bag to help you pack like a pro. The Pro Packing Pouch Set fits both the ZUCA Pro and the ZUCA Sport.